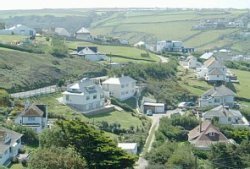 Circa 1940 detached three bedroomed house, fully refurbished in 2001, set on the hillside of Mawgan Porth with unrivalled sea and coastal views from all rooms. The Pin is a superb destination for the discerning holidaymaker. 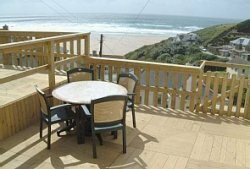 Scenery along this stretch of coast line is spectacular with peaceful footpaths leading to the beach, Bedruthan Steps or west towards Newquay. 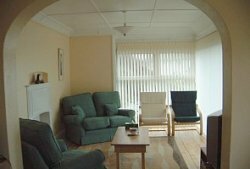 The house is laid out with bedrooms and bathroom/wc and separate w/c on the lower level and lounge, kitchen and dining room on the upper level. All rooms allow guests to take advantage of far-reaching sea views. 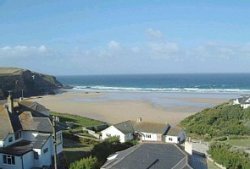 A three minute downhill walk will take you to the popular beach of Mawgan Porth. In addition, the house has a well maintained and largely lawned garden on a sloping aspect with paved terrace and a large decking area which is ideal for sunbathing or al fresco dining. There is parking space for two cars at the lower level and one small car at the upper level.